The captured Jews, participants in the Warsaw ghetto in Novolipie Street (No. 64). Then people were headed to the loading platform (Umschlagplatz). The site was equipped on the railway ramp along Stavki Street No. 4/6. The site was used in 1942-1943 when the Jews were deported to the Treblinka concentration camp. The picture was taken by a photographer of the 689th company of propaganda. 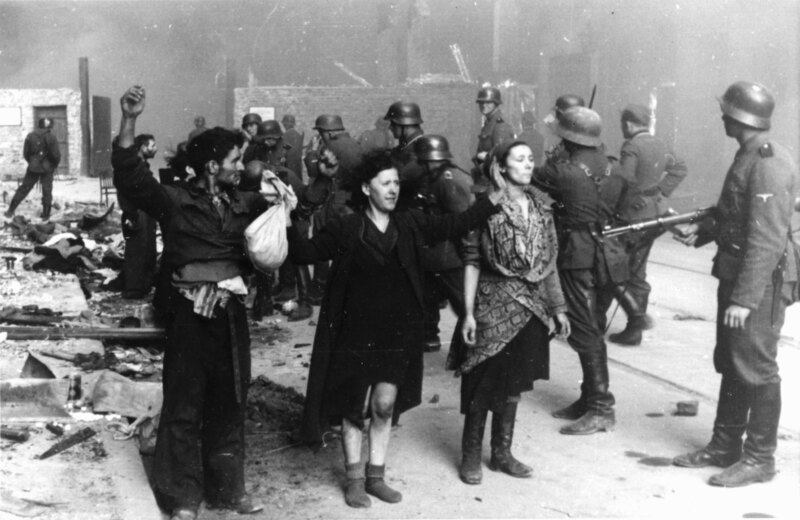 A photograph from the documentary report on the suppression of the uprising in the Warsaw ghetto in the spring of 1943, prepared by Major-General SS Jürgen Stroop, who commanded the German forces that liquidated the Warsaw ghetto. The report was prepared for the Reichsführer SS Heinrich Himmler. The document was prepared in triplicate. One of them was presented as a prosecution case in the international military tribunal in Nuremberg.